We have some very refine vegetable dishes. Great dishes and very appetizing to eat. I remember when I was young, I do not get to cut vegetable for refined dishes. We have to observe the experience cousins using the knife to sliced very fine thin slices for certain dishes. The Nyonya always pride themselves saying their food is very refined. You cannot simply cut vegetable. If cutting vegetable for soups, it has to be squares. Stir fried must be cubes or julienne. Let start to see how some dishes are made. Mix Vegetable Achar or Achat, has Thai influence. It is actually a pickled stir fries. The end results of the dishes must be crunchy. So cutting in strips for all vegetable is important, making sure all are of the same shape and sizes. It helps the vegetables to cook evenly at the same time. Making it crunchy is another story where hot scalding in vinegar is crucial to make it stay crunchy for a longer time. Long beans, french beans, carrot, broccoli, cabbages, cucumber, pineapples are all the vegetable used. Char Chap Chai, is stir fried mix vegetable. Glass noodles, black fungus, chinese mushrooms, cabbages and carrot all are cut in squares, same size like the carrots. A quick stir fries with garlic, ginger and beanspaste completes the cooking. 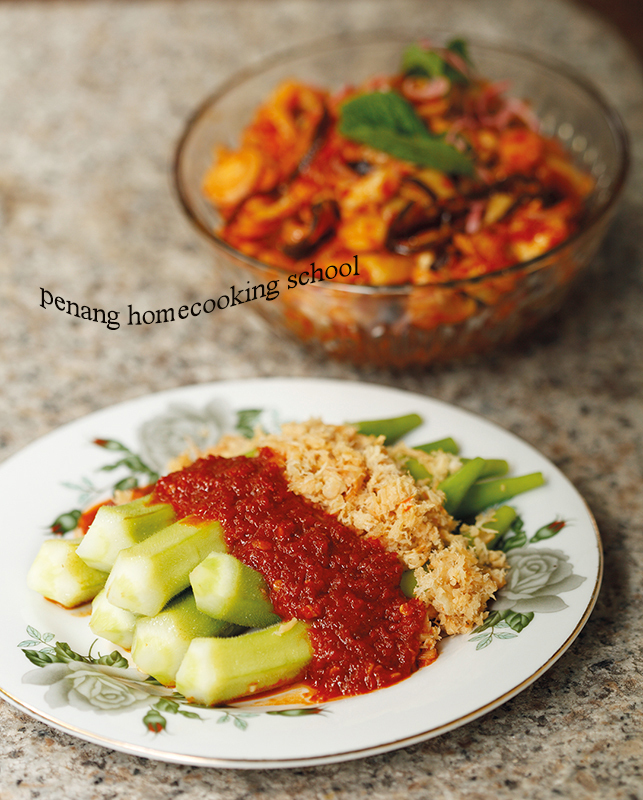 Okra in sambal belachan, is my favourite. There are a few variations for these okra. We can scald it or sliced thin and use sambal belachan to cook it. Or simply mix sambal belachan in soy sauce to make a special sauce. Mostly I love the okra stuffed. 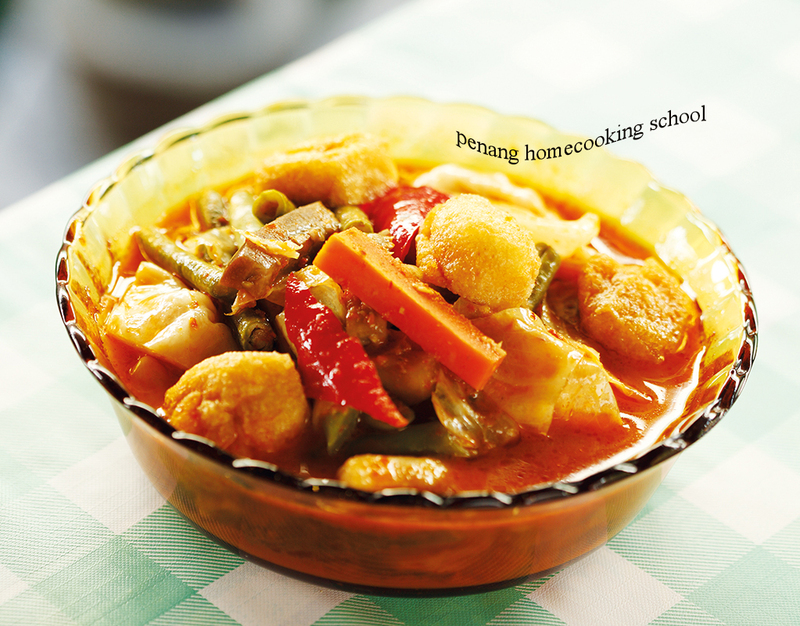 Mix Vegetable curry, uses Indian dried curry powder and some fresh red chilly, onions to cook a couple of vegetables. Suitable for carrots, long beans,cabbages, black fungus, bean puffs and eggplants. A very nice curry that the local loves to add boney salted fish. The Indians have their version with white beans thrown in. Jiew Hu Char is our traditional dish eaten during happy events during pre nuptials wedding dinner and birthday parties. All vegetable are julienne sliced for jicama, onions, Chinese mushrooms and carrots. Cabbage have to be chiffonade. Dried cuttlefish is soaked to wash off some preservative before cooking. We love to wrap it with Chinese lettuce with some sambal belachan. Pineapple parchtree is a sweet curry cooked with coriander powder and brown sugar in coconut cream broth. A western chef was was innovative that he served it as a dessert with coconut cream ice cream. Sometimes, it just work and I am impressed some chefs finds inspiration in our Nyonya food. Thanks for browsing and hope you are not salivating, please take your time to read this. Once you are happy, then book with us. I must tell you, every guest is important to me and Chandra. We love meeting and knowing you.